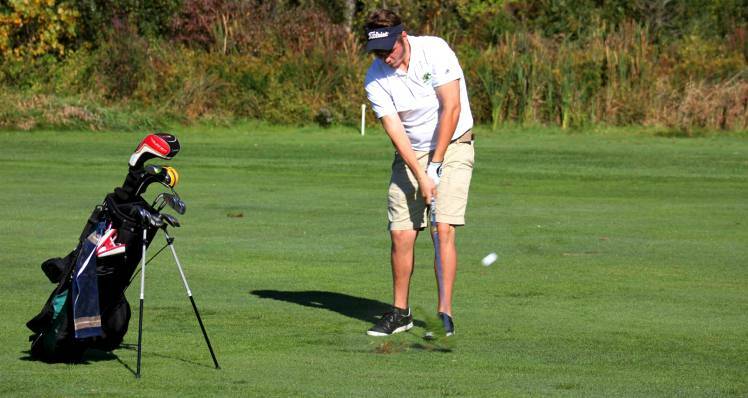 DELPHOS, Ohio — Marygrove men’s golf entered a conference event shorthanded for the second time in as many outings on Tuesday (Sept. 8) as juniors Michael Kanalas and Tyler Newell shouldered the load once again for the Mustangs. Tuesday’s event â WHAC Jamboree Two â was hosted by the University of Northwestern Ohio and was played in Delphos, Ohio at Delphos Country Club. The Mustangs did receive a bit of good news midway through the day as head coach Frank McAuliffe was informed 2015 newcomer Darryl Holtz was cleared for action beginning Wednesday (Sept. 9) at WHAC Jamboree Three in Fort Wayne, Ind. Holtz, a recent graduate of Walled Lake Northern High School, has the ability to be the Mustangs No. 1 golfer as a freshman, adding much-needed depth and talent to a growing golf roster. Newell paced the Mustangs on Tuesday in Ohio, posting an 86 (+15) to finish five shots off of his season-opening 81 set on Saturday (Sept. 5) at LE Kaufman Golf Club in Wyoming, Mich. Newell’s average round sits at 83.5 through two conference outings in 2015, five strokes below his career average through two-plus seasons. Kanalas finished right behind Newell with a round of 87, four off of his pace set at WHAC Jamboree One over the holiday weekend. Kanalas, the Mustangs’ round of 18 leader with a 76 (set in 2014), now owns a 85 average through two events this season. The Mustangs will compete in WHAC Jamboree Three on Wednesday (Sept. 9) in Fort Wayne, Ind. at Fellows Creek Country Club â the site of the 2015 WHAC Championship back on April 16-17.